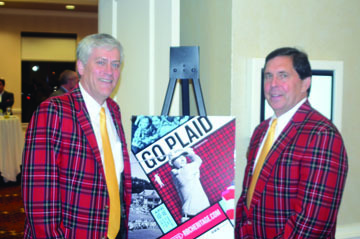 New RBC Heritage Chairman Doug Smith (left) and Tournament Director Steve Wilmot talk about the upcoming tournament. Spartanburg’s Doug Smith has been appointed the Chairman of the 49th RBC Heritage presented by Boeing, The tournament begins at the Harbor Town Golf Links on Hilton Head Island on April 10th. Being the Chairman has some ceremonial duties like leading the parade to open the tournament and acting as master of ceremonies at the opening and closing of the event. However, Smith has been much more than a ceremonial member of the Heritage organization for many years. “I’m looking forward to making sure our sponsors are well taken care of. We have great sponsors and a great tournament. What could be better than being at the Heritage in April,” said Smith. This is the first time in the 49 year history of the tournament that the chairman has come from the Upstate. “Doug was named a Heritage Classic Foundation trustee in 2011,” said Simon Fraser, Heritage Classic Foundation chairman. “His influence and connections in the upstate have helped us spread the mission of the Heritage Classic Foundation, which is to enhance the quality of life and economic vitality of South Carolina through signature golf events,” he added. Smith joined the trustees during a difficult time for the Heritage. The tournament had lost its title sponsor and was in jeopardy of losing its PGA affiliation. As a former State Legislator and community leader in the Upstate, Smith was able to work behind the scenes to help the tournament develop a strong sponsorship base. “Doug is an excellent ambassador for the Heritage Classic Foundation,” Tournament Director Steve Wilmot said. “His connections and reputation across South Carolina are second to none. It’s an honor for the RBC Heritage to have a stand-up professional, colleague and friend like Doug to represent and support our tournament this year,” he said. While the RBC Heritage is played at Hilton Head the reach of the tournament has grown from supporting charitable causes in the low country to helping communities around the entire state. “The tournament is really a state wide event. The benefits from the tournament are distributed around the state and we want everyone to feel a part of the tournament,” said Wilmot. Last year the Heritage Classic Foundation distributed $2.4 million to non-profit organizations around South Carolina. The RBC Heritage has added Mike Ivester as the Director of Corporate Sales to reach into the upstate business community. He is responsible for expanding the foundation’s corporate sales across the Upstate. Ivester spent 11 years as director of sales at the BMW Charity Pro-Am, one of the premier Web.com events on the PGA TOUR. 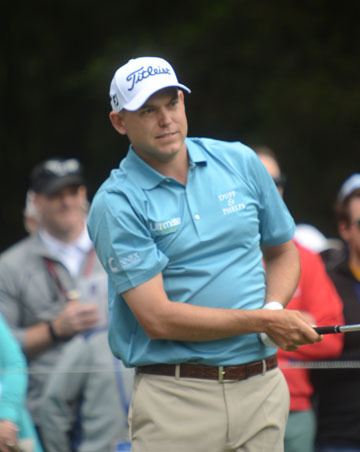 Bill Haas grew up playing golf in the SCJGA and now is a PGA Tour star. Smith is looking forward to seeing many of the players who participated in the junior tournament he helped start, The Bobby Chapman Junior at The Country Club of Spartanburg, now playing at Harbor Town. “The SCGA has done a great job of promoting junior golf in the state and you only have to look at the leader board at PGA Tour events to see the impact our golfers have made on Tour. We have some of the best golfers in the world and the RBC Heritage is one of the best tournaments,” concluded Smith.